We are currently working on our Mommy & Me ABC units. This week was letter N and nightingales! Unless otherwise specified, all of the printables are from my Mommy & Me ABC Printables, which are free as we complete them (for a detailed list of all the materials in the printables, check out this post). This was his desk setup. I just added a magnetic calendar (post coming), but am very happy with it. His white board had some alphabet magnets, and his fridge phonics set. The shelf had a bunch of Ns, a toy nightingale, and some N books. Putting together the bird from his pattern block puzzles. Not sure why he chose to do it there, reaching over his phone. I had him match some number tiles to the card with the corresponding number of nightingales. He did a pretty good job, but was upset there wasn't one with seven. Next time I guess I need to print all the cards! Xander really liked the shape matching activity this week. He thought the nests were fun, maybe because we've been talking about birds we see outside. The picture to the bottom right is him jumping up and down yelling "HOORAY" for matching them all correctly. I found a recipe for some birdseed ornaments on Pinterest (link here), and knew we had to make some! Xander had a blast! We put one on the deck and have enjoyed watching the birds eat it. We got the prettiest cardinal the other day, but it flew away before I could get the camera out. With a little note and in a cute box the ornaments also made a nice little appreciation gift for our day care provider. We will definitely be doing these again! As a warp up to our Nightingale week I made some eggs in potato nests (adapted from here). For added vocabulary I had out his Baby Sealife Toob and the matching 3 part cards I made (you can find the post with the printable here). He can read them all, but sometimes struggles with the sea lion and the humpback whale. One day he wanted to match them in his pocket chart. 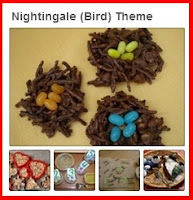 For more ideas, check out my Nightingale/Bird Theme Pinterest Board! I recently made some 3 Part Cards to go with our Baby Sealife Toob and thought I would share! Xander absolutely loves playing matching games with these types of cards, but he likes it even better when he has the toy to go with! You can download the cards here. 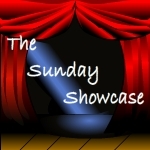 You can download the corresponding Little Reader lesson here! We are currently working on our Mommy & Me ABC units. This week was letter M and monkeys! I actually had a lot of trouble putting this set together. I had trouble finding images of monkeys that were true monkeys and not apes. That is why most of the pictures are of a marmoset, which is not the "stereotypical" monkey. Unless otherwise specified, all of the printables are from my Mommy & Me ABC Printables, which are free as we complete them (for a detailed list of all the materials in the printables, check out this post). His white board had some alphabet magnets, and his fridge phonics set. The shelf had a bunch of Ms, some monkeys, and some monkey books. Stretching to reach the fridge phonics! Balancing monkeys on his peg letter m.
Using his alphabet stamper and his alphabet play dough mat. I gave Xander two colors of pom poms so that he could put one color on the big Ms and the other on the little Ms. He did a pretty good job distinguishing the two. This activity is hit or miss with Xander. I think it is too easy. I had a bunch of mini jungles with the name of a shape and then some monkey cut outs with shapes for him to match. Chocolate covered bananas seemed like the perfect treat to go with our monkey week! They were a HUGE hit. I picked up a package of Expo washable dry erase markers, and I really like them. Very bright colors, but vibrant. I think I may like them better than the Crayola ones, but I'm not positive yet. Working on some alphabet puzzles. Playing with his number train.